Chris found his love for the game of poker after catching the WSOP on TV back in 2003. Like many others, he become consumed by it and wanted to learn as much as possible. So back in 04/05, Chris looked up Daniel online and ultimately landed himself on FCP, which he now calls home. “I had never been a member of an online community or anything. I basically lurked for 2 months until something finally moved me to create an account and post,” said Chris. Since then, the community has got to enjoy plenty of his jokes & insight as he’s accumulated over 22,000 posts at the time of this write up. “At this point I’ve decided to take a break from being really serious about poker. However, I still make sure to visit various forums to keep up to date with the trends.” Jon still occasionally watches poker training videos just in case online poker ever becomes regulated in the US. After seeing Daniel’s ESPN appearances, strategy began reading Daniel’s blog and signed up to the forums shortly after they were launched. “I regret my procrastination with registering, as there are still a handful of active members who predate me and remind me of that fact from time to time,” said strategy. The beginning of his poker obsession came in 2005 when, in a 48 hour span, he inexplicably made two final tables in small nightly online MTTs. “I was terrible, but I’d just taken a few thousand dollars off of online poker, so I thought I was amazing.” Posting in FCP’s tournament section opened his eyes to a variety of new strategies (no pun intended) that he wasn’t aware of. 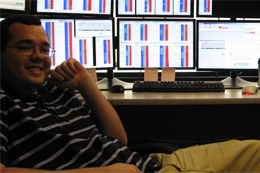 While playing online during his college days, strategy’s biggest accomplishment was forming a lucrative strategy to attack the PokerStars $22 180s. You can read about that tournament here. Like many others, Dubey first got interested in poker during the Moneymaker era. He started organizing a weekly poker game with some friends, eventually turning his parent’s basement into a basic poker room, often hosting $20-$50 tournaments with 30-40 people. “My parents played too, so they were cool with it. I started reading a lot of poker books, and learning a lot about the game. It was around this time that I discovered FCP,” said Dubey.